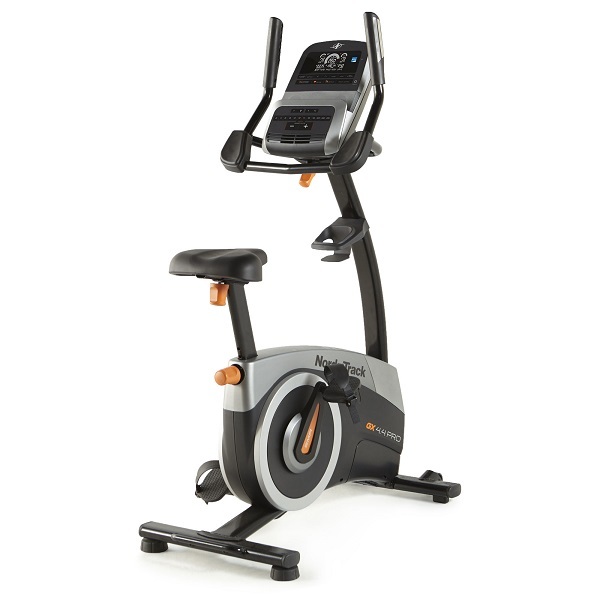 One of the biggest names in home fitness, NordicTrack have been creating high quality exercise bikes for a very long time. Over the last few years they’ve really been pushing hard to up their game and some of their latest offerings have been very impressive indeed. 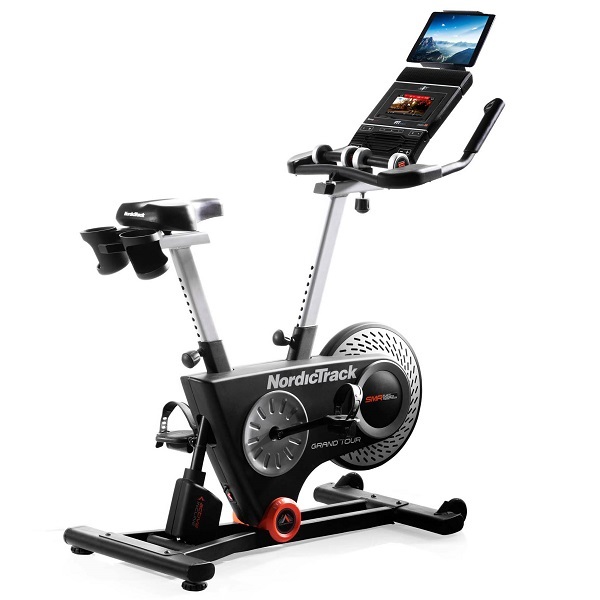 Just a few years ago it was nothing more than wishful thinking to believe that you could have a gym style state of the art bike in your home, at least without paying gym equipment prices, but NordicTrack have been turning their attention to fixing that particular issue and hot on the heels of the TDF bikes we now have the NordicTrack Grand Tour. This really deserved a closer look so that’s exactly what we did…. Assembly is pretty straightforward, especially for such a substantial bike. And a substantial bike is really what the Grand Tour is. Thankfully the bulk of the bike is pre-assembled and there aren’t very many individual components to put together here. The instructions are nice and clear and there’s even an official assembly video available online. All the components were present and correct on the unit we received and everything fitted together perfectly with all holes lining up correctly, which is usually a sign of things to come and a good indicator of the quality of a bike. Once built a quick adjustment of the leg levellers was necessary (thankfully also easy) and the bike was ready to go. Aesthetically the Grand Tour really looks great. It’s obviously chunky and there’s not a flimsy bit of metal in sight anywhere. It looks more like a well engineered machine first and an exercise bike second and this impression is reinforced by the hydraulic piston at the rear being visible and comprising part of the design rather than being hidden away as it would have been in times gone by. It really does look the business, a modern, quality, bit of kit. The question of course is whether it works as good as it looks. Only one way to find out! Comfort on any exercise bike is paramount if it’s not to have a future playing the role of an expensive coat hanger and getting comfortable on the Grand Tour doesn’t take much in the way of effort or patience. The gel saddle is extra wide and soft and can be adjusted both vertically and horizontally by way of quick release adjustment knobs, while the handlebars also adjust vertically and horizontally by way of the same system. It’s simple and effective and makes getting just the right riding position quick and easy. We tested the set up by asking the biggest, tallest and smallest members of the team to see if they could get a good position and without exception every one of our volunteers was ready to go in a less than a couple of minutes reporting that they were happy with their riding positions which bodes very well for the vast majority of people likely to be using this bike. 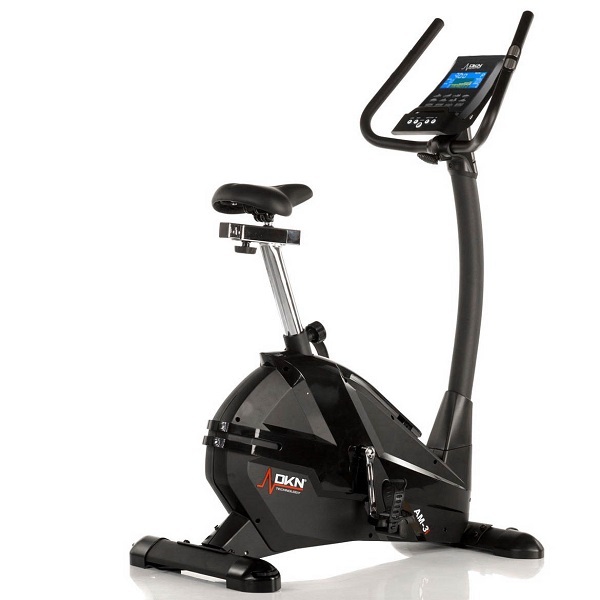 Getting started in the fastest way is simply a case of pressing the start button on the 7″ web-enabled touchscreen display (once it’s booted, which does take a couple of minutes the first time) and starting to pedal. Resistance is adjusted by way of buttons on the console and very handily also on the handlebars. There are 24 levels of resistance to choose from with the top end of the resistance providing plenty of grunt so even fit users are likely to find that it presents a proper challenge. 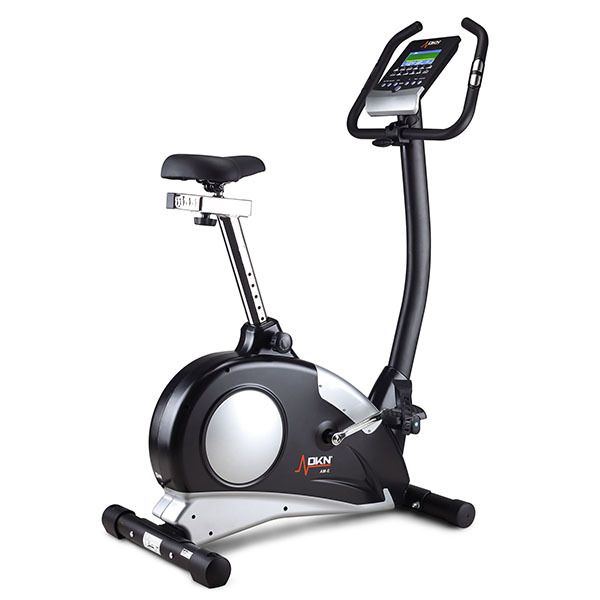 One of the stand out features (and there are a few here) is the motorised incline/decline function. The Grand Tour allows you to adjust your incline position between -10 and 10 degrees simulating real-world hills. Again, adjustment of the incline is controlled by integrated handle controls and also the main buttons on the console. This is a really great feature we first saw on the TDF range of bikes from Proform and it’s been successfully used in the Grand Tour. At first, it’s a bit of fun, seemingly a bit of a novelty, but it really comes into its own when you start getting into other types of workout away from the manual mode. The transition from one angle to another is smooth, responsive and also quiet which is another sign of quality of the components used in this bike. Away from the manual mode there’s a large range of 32 on-board workouts to choose from. These are accessed by way of touching the cyclist icon which then takes you to another set of options. Operating the console if you already own a tablet or a smart phone is really second nature as in essence the console is a tablet. Each workout displays the estimated duration and distance as well as the approximate number of calories it should burn. Obviously, this is really just an estimate, nevertheless it’s a nice way of selecting which workout you want to perform. At the start of each workout there’s a sensible warm up period before the actual workout begins and while it’s always a good idea to warm up before your ride, for those impatient to get cracking it’s possible to bypass the warm-up at the touch of a button. 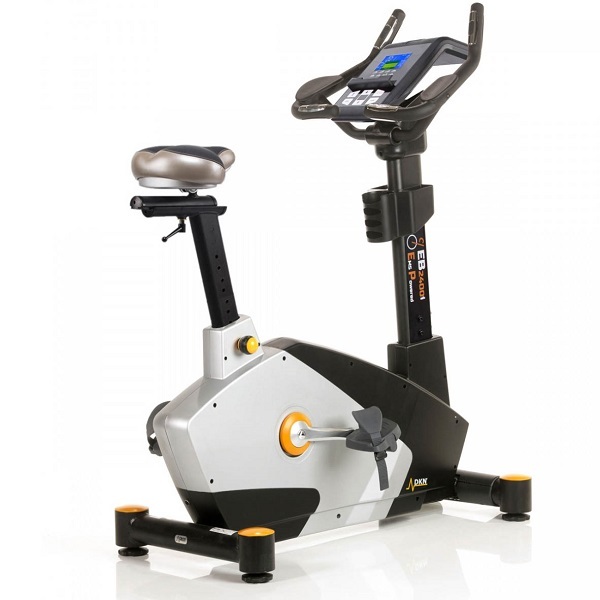 Once you get going you’re provided with a target pedalling speed (RPM) to keep you exercising in the right zone. Drop below this speed and the screen prompts you to speed up, pedal too fast and it’ll prompt you to slow down and if you’re getting it right it tells you so. It’s a very good system, albeit a simple concept, as it ensures that you get as close as possible to the intended end result. Follow this as you’re supposed to and you’re more or less guaranteed to get the workout benefits you were expecting which makes planning and executing your exercise regime and measuring your progress that much easier. 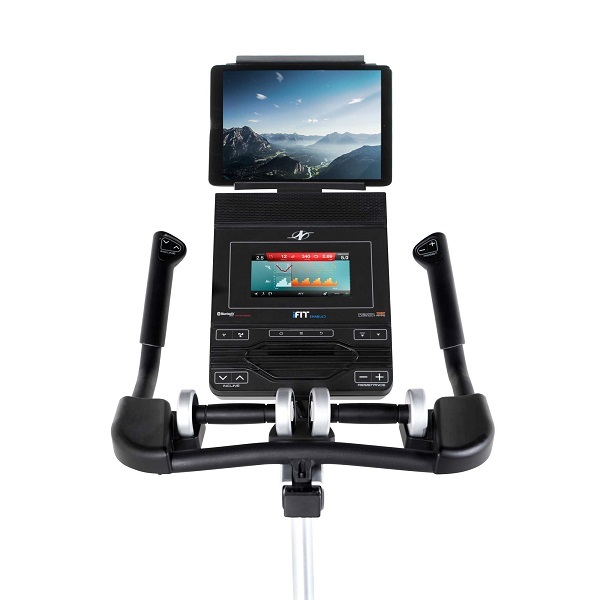 In addition to the pre-set workouts you can also set targets (what NordicTrack prefer to call Goals) for calorie burn, distance and so on which is a feature that will appeal to a lot of riders. As mentioned earlier the incline system really comes into its own when using the built-in workouts but if you subscribe to iFit it gets even better. Subscribers to iFit get the added bonus of Google Maps workouts that allow you to map out your own cycling routes on Google Maps, high-definition workout videos led by professional personal trainers, online races against other iFit riders and personalised advice for meals, exercise routines and your sleep schedule. 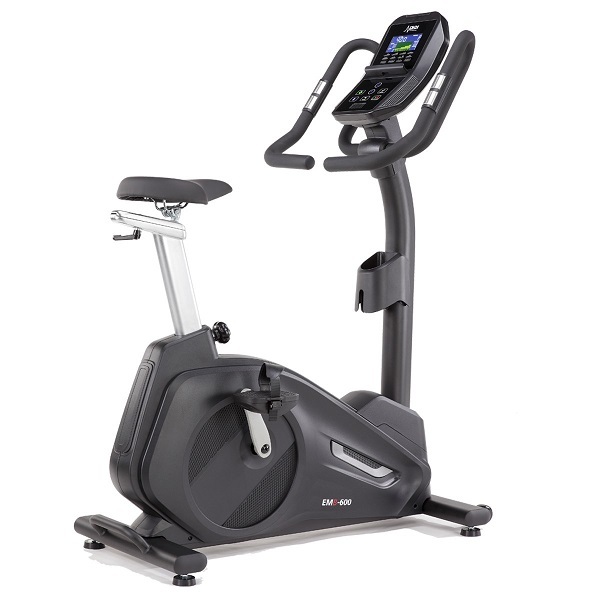 iFit is a whole world unto itself and offers far too much to cover in this review but if you want to know more just visit the iFit web site for full details. For monitoring your pulse NordicTrack have done something we wish more bike manufacturers would do – they’ve dropped the pretence that hand-pulse sensors are any good for monitoring your pulse and have removed them completely from featuring on the Grand Tour. Finally! If you want to measure your pulse, you want to measure it accurately or not at all and the inclusion of a Bluetooth Smart wireless receiver allows you to connect a compatible Bluetooth chest belt. This set-up, as expected, worked perfectly during testing. As always with NordicTrack bikes the Grand Tour isn’t short of the little touches. There’s a dual speed fan that does a decent job and two water bottles holders behind the saddle. Though it’s not the first place one would think to put a water bottle holder there’s one on each side so it works for both lefties and righties. It’s a bit awkward, but not a deal breaker. There’s also an adjustable tablet holder on top of the console should you find the built-in touch screen isn’t enough for you. Last but not least there’s even the very unusual addition of a pair of 3lb (1.3kg) dumbbells that are mounted on a special bracket located in between handlebars so you can work your upper body while cycling. Quite what these exercises could or should be NordicTrack are strangely silent on in the user manual but in principle the idea is sound and so should be welcomed ? The Grand Tour definitely lives up to its name. 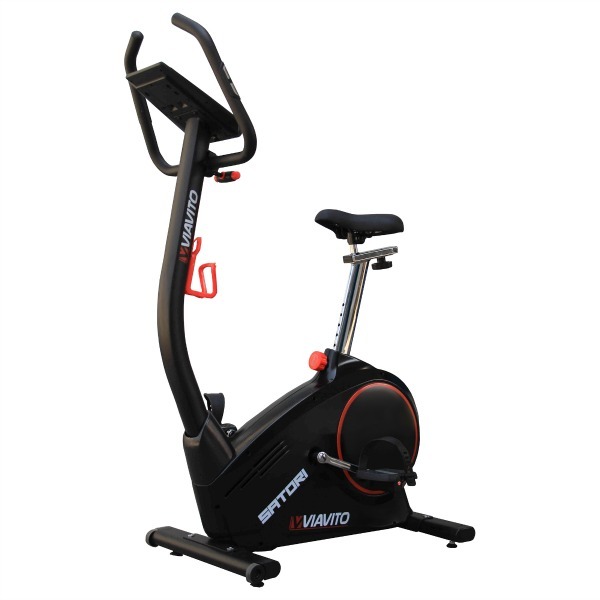 It is a grand bike, packed with features and including an incline mechanism that really adds a very enjoyable dimension to everything. It’s also built splendidly well, a fact that’s backed up by NordicTrack’s 5 years frame, 2 years parts and labour warranty. It offers something over and above other bikes and it does what it does really well. As such we’re happy to recommend this wonderful creation. We love it and if you buy one, you probably will too……. The NordicTrack Grand Tour is not currently available from any retailers we're aware of in the UK. NordicTrack have a winner on their hands here. No doubt about it. The Grand Tour is well put together, very comfortable and packed with enough features to keep you entertained practically forever. And that incline/decline system simply brings the whole experience to life. It's effective and it's engaging and it's bound to keep you coming back for more. This really is the sort of bike that only a short while ago you'd expect to only find in gyms, and at this price what you're getting here it's simply fantastic value for money. A really superb bike and one we're very happy to highly recommend.